Sacrifice is a part of the Christian faith. We sacrifice our lives daily as we live with the impact of Christ’s sacrifice for us. While making a sacrifice isn’t easy, it does remind us that we need to hold loosely to the things of this world. Heaven is our true home and everything we give up on earth is temporary compared to eternity. 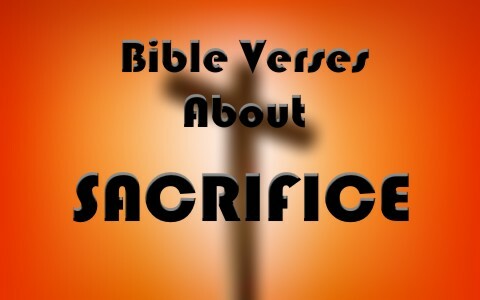 Since the concept of sacrifice is so important for believers, take time today to learn from the 7 important Bible verses about sacrifice. “But Samuel replied: ‘Does the Lord delight in burnt offerings and sacrifices as much as in obeying the Lord? To obey is better than sacrifice, and to heed is better than the fat of rams” (1 Samuel 15:22). Many believers sacrifice their time, money, and energy doing good works for God. However, we must be careful to not let the sacrifice take precedence over our obedience to the teachings of the Bible. A sacrificial gift to the Lord is honored as long as we are obeying His commandments and teaching others to do as well. “But the king replied to Araunah, ‘No, I insist on paying you for it. I will not sacrifice to the Lord my God burnt offerings that cost me nothing”” (2 Samuel 24:24). A sacrifice may be freely given, but it’s not a genuine sacrifice if it doesn’t mean anything to us. When we feel the pain of our sacrifice—we know that we are really giving up something important. As we grow in our faith, we give our sacrifices to God more freely because we understand His greater sacrifice that allows us to know His grace. “My sacrifice, O God, is a broken spirit; a broken and contrite heart you, God, will not despise” (Psalm 51:17). When we sincerely seek after God’s forgiveness for our sins, it’s a sacrifice that He will never turn away. The Lord wants us to come to Him and be made clean from our sinful choices. Many times pride blocks us from admitting our sins. Yet when we humble ourselves, we find His grace and forgiveness. Every day we have the choice to offer our bodies as living sacrifices to God. The Lord doesn’t force His children to obey Him; rather He longs for us to choose His ways over our own desires. Our sacrifice of living for Jesus on a daily basis in spite of the temptations, trials, and tragedies of life encourages an investment of sacrifice with an eternity of rewards. “Through Jesus, therefore, let us continually offer to God a sacrifice of praise—the fruit of lips that openly profess his name” (Hebrews 13:15). When we take the time to be thankful, we are giving God a sacrifice. It may not feel like a sacrifice to us, but when we consider His faithfulness to the world—we respond with gratefulness. Many people will go about their day-to-day activities and never once give God the sacrifice of thanksgiving. However, as believers we press towards being thankful every single day. As followers of Jesus Christ, we are often compelled to do good for others even though they don’t always return the favor. Yet we sacrifices with good works and the sharing of our resources as to the Lord and not to men. Our Father in heaven is pleased to see His children doing the right things in spite the pressure to only please themselves. “God presented Christ as a sacrifice of atonement, through the shedding of his blood—to be received by faith” (Romans 3:25). The sacrifice of Jesus covered the sins of all people once and forever. After Jesus’ death and resurrection, there was no longer a need to sacrifice animals. It was finished at the cross. When we put our trust in Jesus, His blood shed covers us so that we don’t have to pay the penalty for our sins—not that we ever could. We are given opportunities every day to sacrifice our own wants and needs for the furthering of God’s kingdom. As we daily sacrifice, let us keep in mind that everything we do in the name of Jesus Christ is a gift to the One who paid it all at Calvary. I just want to thank you this site it is helping me to understand the will of God….His Promises.. Grace.. Mercy and love he has for us. Nice article. But how can human know this is valid? Maybe it is a trick to make people go suicide and no afterlife for them. There are other theories about God – one of which is that we have pieces of God inside and they need to be connected and we need to stay alive for it to work. Also since when living more or less sin free life requires death? People can still be good people despite being low level sinners. This stuff is confusing, complicated and best of all – NO proof of authority. We humans have no problem following God as long as we know it is not deception from Devil..but if we do not know then our choice can not happen. Hello Eman. The Bible teaches that none or good (Rom 3:10-12), not even one of us, but a good God has to die for bad people or none of us could make it. The Bible is true. Jesus says all must repent and believe (Mark 1:14-15) or die with the wrath of God on them (John 3:36b)…and that settles it. Truth shared from God’s heart . Great insightful article. Thank you so much. You have been helpful. Thanks a lot for the good work you are doing. I now understand the different forms of sacrifice. God bless you abundantly. Previous post: How Does God Reveal Himself To Us?